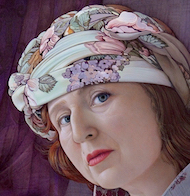 This May, Elena Vladimir Baranoff is exhibiting her first self-portrait painting, entitled "Awakening", in the annual exhibition of the Royal Society of Portrait Painters in London. Painted in handmade genuine egg tempera on board, the artwork presents a moving and searching exploration of personal identity through fine art of portraiture. The self-portrait, completed in 2017, was painted during the creation of the artist's original composition inspired by Charles Perrault's fairy tale "Sleeping Beauty". The exhibition opens to the world public on May 9th throughout 24th 2019, at Mall Galleries, The Mall. 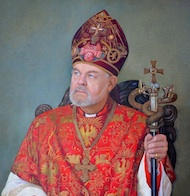 This summer Elena Vladimir Baranoff is exhibiting her new work of art, a portrait painting of The Rt Revd & Rt Hon Richard Chartres KCVO, Lord Bishop Of London, in the BP Portrait Award Exhibition at the National Portrait Gallery, London, UK. Painted from an official sitting at The Old Deanery, the portrait of The Lord Bishop of London represents the technique of hand-made genuine egg tempera, a centuries old painting medium practiced by generations of icon writers. Created in the artist's signature style, the artwork features a color palette of crimson, magenta and scarlet hues, balanced by smooth earth tones. The exhibition opened to the world public on June 23rd throughout 4th September, 2016. From London the show shall travel on a UK museum tour to Usher Gallery in Lincoln (12 September – 13 November 2016), Scottish National Portrait Gallery, Edinburgh (late November – late March 2017) and the New Walk Museum & Art Gallery, Leicester (8/9 April – 11 June 2017). The BP Portrait Award Exhibition is the most distinguished international portrait painting exhibition of its kind and a leading highlight of the annual art calendar. Founded by egg tempera masters Elena Vladimir Baranoff and Anastasia Elena Baranoff, Egg Tempera Movement revitalizes the rare fine art tradition of genuine egg tempera, creating and widely promoting fine art paintings in this oldest medium known to mankind. Egg Tempera Movement strives to motivate and inspire interest among art collectors and the public in new and original works of fine art created in the centuries old genuine egg tempera technique. 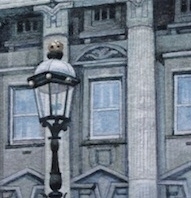 Elena Vladimir Baranoff is exhibiting her works of art, a genuine egg tempera painting entitled "An Evening With Buckingham Palace" and a genuine egg tempera miniature painting entitled "Westminster Abbey 2011" , in the 4th Annual Laumeister Fine Art Exhibition at The Bennington Center For The Arts. The fine art exhibition shall be unveiled to art patrons and connoisseurs on August 11th and remain on view throughout the famous New England foliage season. The Bennington Center for the Arts, a cultural, state-of-the-art venue, hosts some of the finest, world-class fine art exhibitions. Elena Vladimir Baranoff was honored with the prestigious "El Dorado Award" for her miniature painting "Westminster Abbey 2011" by The El Dorado Fine Arts Gallery during the 31st Annual Miniature Art Show, April 29 - May 13, 2012 in Colorado Springs, Colorado, USA. The fine art exhibition was dedicated to the promotion of the beautiful and rare art form of the miniature. 80 artists from around the world were chosen to participate in the annual show and enthusiastically supported the El Dorado Fine Arts Gallery in its effort to present the art of the miniature to the American audience. 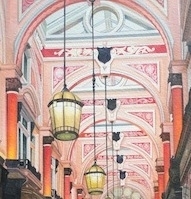 Elena Vladimir Baranoff is exhibiting her works of art , a watercolor painting entitled "London Pub - A Place For Real Conversation" and a genuine egg tempera painting entitled "The Royal Arcade - A Stylishly Victorian London Connection", in the American Artists Abroad Exhibition at The Bennington Center For The Arts. The fine art exhibition features artwork from around the world created by North American artists. 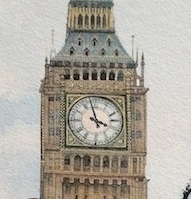 Elena Vladimir Baranoff is exhibiting her work of art , a watercolor of Big Ben entitled "Alone with Big Ben", in the 51st National Exhibition of Aqueous Media Painting at Springfield Art Museum. 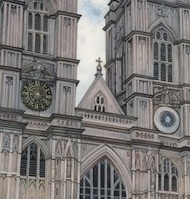 Works of miniature art, "Westminster Abbey 2011", "Big Ben" and "A Stroll Through Green Park", by Elena Vladimir Baranoff from her London Cityscape Fine Art Collection, celebrating Olympic London 2012 in the USA, are exhibited in the 31st Annual Miniature Art Show at the El Dorado Fine Arts Gallery in the historic "Old Colorado City" of Colorado Springs. On February 29th 2012 the official Elena Vladimir Baranoff Fine Art Channel was launched with the worldwide broadcast of the first film featurette highlighting the painting "The Golden Rooster"
The channel will serve as a gateway into the enchanting world of art where paintings inspired by fairy tales, fables, and magical stories are created from the imagination of fine artist Elena Baranoff with a stoke of a paint brush. Subscribe to the Elena Baranoff Fine Art Channel and learn about, experience and enjoy great art. 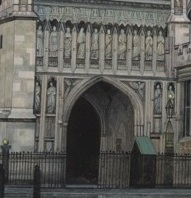 The miniature "Westminster Abbey 2011" is exhibited at Mall Galleries, The Mall, London during the month of October 2011 and awarded The Gold Memorial Bowl Honourable Mention Award by The Royal Miniature Society. The creation of the portrait of Westminster Abbey was inspired by the mesmerizing Royal Wedding Ceremony of Their Royal Highnesses The Duke and Duchess of Cambridge. Original sketches from the artist's many visits to London served as the basis for the creation of the miniature treasure. 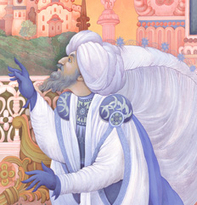 Painted in genuine egg tempera on vellum, the architectural portrait celebrates the historic event of the 21st century. Elena Vladimir Baranoff is exhibiting her portrait of The Right Honourable The Lord Mark Poltimore, Deputy Chairman Sotheby's Europe and Chairman Sotheby's Russia, at the National Portrait Gallery, London. The portrait was unveiled to the public for the very first time as part of the BP Portrait Award Exhibition held at the National Portrait Gallery from June 18 through September 20, 2009, and shall later travel on tour to museums across the United Kingdom. Elena Vladimir Baranoff was inspired to paint a portrait of Lord Poltimore after attending an art auction in London. The official sittings took place at Sotheby's New Bond Street during the early months of 2009. 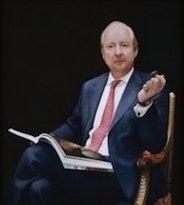 "Lord Poltimore's elegance and artistic ability to engage the art collectors and control the auction process was inspiring" said the artist "In my portrait I wished to capture the unique spirit of the legendary auctioneer." The portrait harmoniously combines modern flare and classic elegance with its dramatic lighting, deep dark background and rich colors. The artist's highly innovative painting technique, developed with years of experimentation and experience, makes this work of art all the more unique. The portrait was painted on a marble gesso panel in timeless genuine egg tempera, using rare pigments as lapis lazuli and malachite, all natural dry colors which the artist hand prepares using a recipe passed down by generations of icon painters. 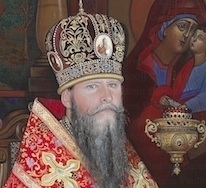 Painted in the artist’s signature technique of genuine egg tempera, the portrait of His Eminence Archbishop Kyrill of San Francisco and Western America was inspired by the beauty of the Russian Orthodox Church and the graceful image of His Eminence Archbishop Kyrill. Archbishop Kyrill officially sat for the miniature portrait in his private chapel in San Franicisco, California. 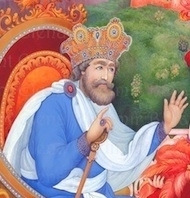 The artwork is exhibited at Mall Galleries, The Mall during the month of October 2008 and awarded The Gold Memorial Bowl Honourable Mention Award by The Royal Society of Miniature Painters. "The Prince of Wales was today presented with a miniature portrait of his late grandmother, the Queen Mother, during an official visit to an art gallery. Charles said he was "greatly touched" to receive the gift..." "I'm greatly touched to receive this marvellous portrait of my darling grandmother that is so exquisitely painted." "It is absolutely wonderful. It really does look like my grandmother." The portrait miniature of Her Majesty Queen Elizabeth, The Queen Mother painted by Elena Vladimir Baranoff in her signature technique of egg tempera, served as an official gift from The Royal Miniature Society to their new Royal Patron, The Price of Wales, and was presented to His Royal Highness during an official visit to the RMS annual fine art exhibition.